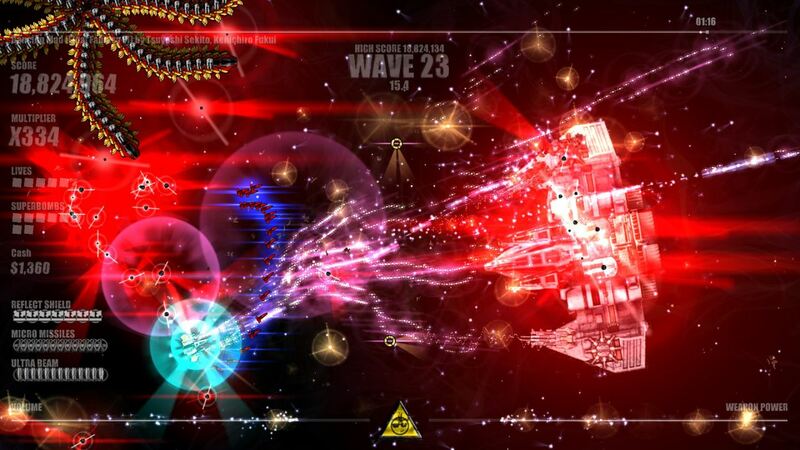 For those who have yet to play Beat Hazard Ultra, imagine playing a twin-stick shooter where everything is based on the music playing – enemy spawns, the power of your guns and so on. Add some extremely flashy visuals, a nifty upgrade/unlock system and a wealth of different modes and, well, that pretty much sums this one up. Actually, since I like linking to my stuff, here – have a glance at my Beat Hazard Ultra review. Bits and pieces may differ from the XBLIG version, but it beats scribbling a massive ‘this is Beat Hazard Ultra’ that for the most part would just be a repeat of content in the review. The above is a tl;dr version for those who already own the original and just want to know what’s new. Yeah, that’s right: Ultra isn’t an expansion or DLC in the XBLIG version, so you’re gonna have to part with 400 MSP to get it; regardless of whether you already own the original. Fairly certain we can blame Microsoft for that. Same thing happened when DLC Quest got its Live Freemium Or Die expansion, after all. Since the complete game is on so many platforms now, here’s a quick round-up: Android (Google Play), iOS (iTunes), Windows/Mac (Steam), XBLIG (Xbox Live Marketplace).